The tragedy of the loss in 1941 of two Royal Navy capital ships, HMS Prince of Wales and HMS Repulse, the core of Churchill’s deterrent Force Z, stunned the world. Churchill had hoped that sending a small powerful squadron of ships to Singapore would deter a threatened Japanese invasion of Malaya and Thailand. He was to be proved tragically wrong. Denuded of aircraft cover, Force Z was left disastrously exposed to air attack. Within eight days of their arrival at Singapore both ships were sunk with huge loss of life in a mass attack by 85 Japanese bombers. It was the Royal Navy’s greatest loss in a single engagement and the first time a modern battleship had been sunk by air power. With the naval force at the bottom of the sea, and the RAF almost wiped out in Malaya on day one, Singapore was left with no air or sea protection and fell two months later. 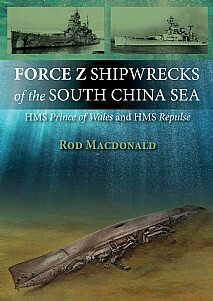 This is the first book to explore in detail the wrecks of these two vessels and grippingly narrates a summary of the Japanese threat, Fortress Singapore and the subsequent Japanese invasion. Today the wrecks of these two famous British warships lie on the bottom of the South China Sea, 200 miles north of Singapore and 50 miles offshore. The author was invited as a civilian expert on a military expedition to dive and survey these wrecks and now, for the first time, the wrecks are revealed as they are today. Beautifully illustrated with specially commissioned artist’s illustrations of the wrecks, each one is looked at in detail. The story of the loss of these two ships, and of the sacrifice of the men who served in them, is remembered. This has been a personal quest for the author whose grandfather was serving in Singapore when Force Z arrived. His wife and the author’s father and two brothers were among the last civilians evacuated from Singapore before the final siege. His grandfather was taken into internment at Changi Gaol by the Japanese and suffered there for three years until Singapore was reoccupied by the British in 1945. Had the Fall of Singapore not happened the way it did the author would not be here to write this truly remarkable book. This will be of enormous appeal to divers, anyone interested in history, the sea, maritime and military history as well as those with an interest in shipwrecks.